Case: Kimberly-Clark Keeps Client Costco in Diapers 1. Why are major retailers moving toward relationships in which the supplier manages inventory levels at the retailer? Traditionally, the retailer handles the replenishment process, and the supplier has no clear information on the demand side or advance warning about out-of-stock situation. As a result, the supplier tends to maintain a certain level of safety stocks as a "buffer" in order to facilitate sales and the customer would also keep some safety stocks in case of none-supply. This results in long supply chain and lacks of flexibility. Through supplier managed inventory programs, suppliers get to know the actual supply and demand and thus can deploy better logistic plans to response the fluctuating market situation. ...read more. an multinational environment with multiple origins and diverse concentration of suppliers, the coordination work usually takes more than simply handle the logistical work in-house. 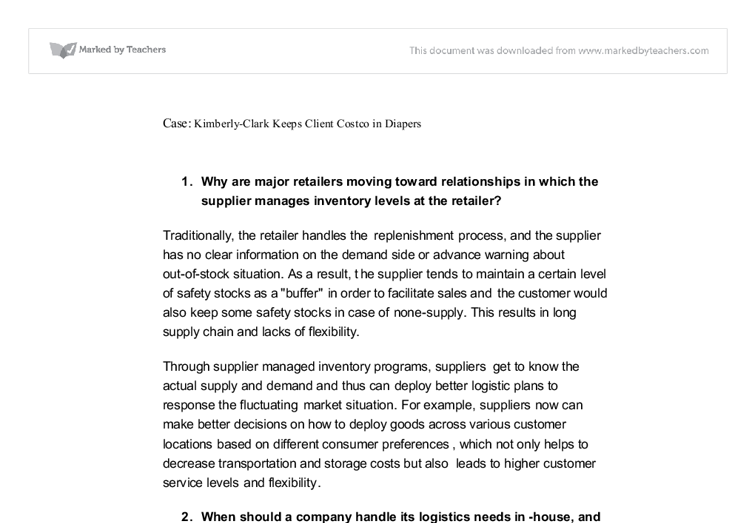 The ultimate goal of supplier managed inventory program still lies on the efficiency issue. The cost to integrate the information flow between the supplier and retailer should be measured against the potential benefit in order to make the wise decision. 3. 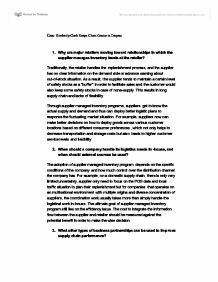 What other types of business partnerships can be used to improve supply chain performance? Collaborative forecasting is also a good way to increase the supply chain efficiency. In the traditional approach, retailers collect and analyze POS data to prepare their sales plan while in collaborative forecasting, data are not only collected in the retailer's POS, consumers and suppliers also play important roles in sharing their own opinion. ...read more. Can pressures such as the ones described in this case be used to a company's advantage? In the case, the retailer is under the pressure of keeping diapers in stock and making it as cheap as possible in order to trigger sales. However, we can view it differently. For example, the customers are generally very price driven for diapers, which means as long as the company keeps good track on their supply chain management of these products, the company can save tons of money in marketing these products and can also leverage the products' ability to attract customers to the store to trigger other sales. As in this case, Costco leveraged Kimberly-Clark for the diaper inventory management, Costco then in turn can turn to focus on marketing other products such as baby lotion or baby food to stimulate its revenue. ...read more. Thai Tuan is facing big problem from dumping of Chinese fabrics. Despite being bad quality, Chinese fabrics are richer in pattern and size than Thai Tuan's ones. To improve this, Thai Tuan needs to invest much money in technology, machinery; constructing new plants or having plant expansions. who eat out regularly has risen This trend is set to continue thereby increasing the potential consumer base. * Increasing acceptance of diverse cultures - More and more New Zealanders begin to accept the cultures from East Asian. Chinese food culture has been widely accepted all over the world. Perforation helps to dry parts of socks which are pulled on Dryer. Most of air go through main ventilators, dry socks and put them up. ________________ MARKET ANALYSIS AND STRATEGIES 4.1 Customers 1. Discuss who the customers for the product or service are or will be. India now has pockets of strengths in key high technology industries such as software and pharmaceuticals. Why do you think India is developing strength in these areas? How might success in these industries help to generate growth in other sectors of the Indian economy?